WHY DOES THE VOLCANO COST SO MUCH? WHAT IF I NEED A REPAIR OR REPLACEMENT? WHICH PARTS OF THE VOLCANO ARE SUBJEST TO WEAR? CAN DEBRIS GET INTO THE BALLOON? CAN THE VOLCANO BURN THE MATERIAL BEING VAPORIZED? HOW LONG CAN THE VAPORS BE STORED IN THE BALLOON? WHAT FACTORS DETERMINE THE QUALITY OF THE VAPOR IN THE BALLOON? WHAT IS THE BEST TEMPERATURE SETTING FOR MY VOLCANO? In developing the Volcano our aim was to offer a Vaporizer with in all respects outstanding features. We not only focused on top-quality material and workmanship - a matter of fact for us - but primarily on offering the user a safe device for convenient application which is easy to operate. In addition, it was our intention to create the prerequisites for an efficient and controlled vaporization. In order to achieve optimum results, a Vaporizer requires a membrane pump to evenly pump air, a heat accumulator to evenly heat the air and a valve technology to ensure a simple, reliable and convenient application. If you read through the section on the Volcano technology you will see why that is the case. Those features are only offered by the Volcano. Other vaporizers which are supposedly „equally good“ can be a heavy pull on your purse if you decide to stop using them, because you are dissatisfied with their performance and then simply leave the equipment standing around unused. Due to our experience with vaporizers – and as a matter of fact we are familiar with all models available on the market – we are absolutely convinced that the Volcano offers the best price-performance ratio. "There is hardly anything in the world that someone cannot make a little worse and sell a little cheaper, and the people who consider price alone are that person's lawful prey. It's unwise to pay too much, but it's worse to pay too little. When you pay too much, you lose a little money - that is all. When you pay too little, you sometimes lose everything, because the thing you bought was incapable of doing the thing it was bought to do. The common law of business balance prohibits paying a little and getting a lot - it can't be done. If you deal with the lowest bidder, it is well to add something for the risk you run, and if you do that you will have enough to pay for something better." In the event of any defect you are recommended to send the complete device back to the factory with all parts. If the defect has occurred on the grounds of a material or construction error within the warranty period, we will eliminate the defect free of charge. If the defect was caused by you, e.g. because you dropped your Vaporizer, the factory will send you an estimate for the repair and will do the repair at short notice as soon as you have agreed to accept our estimate. As we have hardly received any complaints since we started selling our product in November 2000 and we are convinced of the high quality and service performance of our products, we have extended our warranty period to 3 years. Of course, that also applies with retroactive effect to all Volcanos we have manufactured to date. First of all the balloon, which has to be replaced by a new balloon after cleaning the valve set in regular intervals (after 50 - 100 balloon fillings). The balloon used is a Melitta® Toppits Bratschlauch Type "extrabreit". (Melitta® Toppits oven hose - type extra-wide).. A roll with 3 metres of this product is enclosed with each Volcano, that is sufficient for 5-6 balloons. You may also use other oven hoses or oven bags, e.g. in the U.S.A. use Reynolds® oven bags Type "large". By far less seldom (approx. 1x per year in everyday use) it may be necessary to replace the filling chamber screens. Each complete set is furnished with 4 top and 4 bottom screens. That will last a long time. No other parts are subject to wear and tear. As we continuously endeavour to improve our products, we deliver all new Volcanos with a screen brace disc which reliably prevents the screen from being bent when it is inserted. The owners of older Volcanos can contact us to order this screen brace disc free of charge. It fits into all previously delivered Volcanos. If the top filling chamber screen is bent (by using it without screen brace disc), that will create a gap between the screen and filling chamber cylinder through which particles can be blown into the balloon. Ensure as described in the operating manual, that the top screen is always flat and not clogged. You will always enjoy an untroubled application, if you ensure that the filling chamber, valve and mouthpiece are regularly cleaned. No. That can happen with other Vaporizers, but not if you decide in favour of the Volcano. The user's safety has always been our top priority. That is why we have adjusted the controller so that critical air temperatures above 230°C (447°F) in the filling chamber cannot be reached. An effective vaporizer should be constructed in such a manner which rules out the combustion of herbal material from the beginning on. The vapors in the balloon condense in the course of time at the balloon shell. But that is a process which takes hours. If you inhale the balloon contents within 5-10 minutes you will have more or less no loss at all. The valve balloon is not designed to "store" vapor, it allows moreover the user to conveniently inhale independent of the device in line with the user's individual requirements, making it comparable with a glass which is easier to drink out of than directly from the water tap. The proportion of flavour and active ingredient vapor in the balloon primarily depends on the quality and quantity of material with which the vaporizer is filled. Other important factors are the surface area of the material and the vaporizing temperature. It is clear that the quality of the material being vaporized is important, as is the quantity involved - more material means greater vaporization. One should note that a minimum quantity is required to generate sufficient vapor, a fact which brings us to the question of surface area. Anyone who e.g. rolls ½ g of material into a ball and deposits it in the vaporizer will be sorely disappointed with the result, as practically no vapour rises and an equally negligible effect is achieved. Shreding the same amount of material into small particles, and the subsequently greater surface area achieved, will, in contrast, generate strong vapor, the effect achieved being also greater as a consequence. Flavours and active ingredients can only vaporize from material if they are close enough to the surface. Grinding the material occasionally with ones fingers between vaporizing procedures is thus advantageous, as this exposes the material previously concealed in the interior. The material should not be packed into the filling chamber, as loosely-deposited material facilitates the free circulation of hot air. 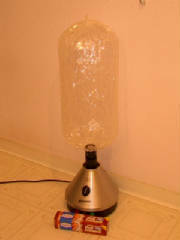 The vaporizing temperature also plays a significant role, as already mentioned. The higher the temperature, the greater the volume of flavours and active ingredients released in a single procedure. However, temperatures higher than really necessary adversely effect the flavour. An increase in temperature is thus particularly advisable if the effect achieved is diminished and considerably less vapor is generated after several procedures. This enables one to obtain the residual benefit from the material. Incidentally, the flavour has little to do with the effect. Flavour inducers (relatively volatile essential oils) vaporize much quicker than active ingredients. The initial flavour vanishes after the first few procedures, but the effect is still undiminished. Flavour in any case primarily depends on that which is deposited in the vaporizer. An effective vaporizer does not influence the flavour in any way. The temperature is only one of the four factors for vapor build-up. The temperatures recommended for the various materials only serve as reference values. The temperatures should be principally selected as low as possible, so that vapors only just develop. The accuracy of temperature indicators on vaporizers should not be relied upon. Even digital displays which appear to be extremely accurate are misleading if the display does not correspond to the actual temperature in the filling chamber. Conducting ones own observations is better in this respect. Exactly in connection with this issue the Volcano offers you an additional unique advantage of the valve balloon. The vapor build-up in the balloon is very easy to observe and the user learns within a very short space of time to reliably handle the device and the various materials. The Volcano with its valve balloon is the only device to offer you this optical control feature! The temperature setting is perfect when a fine, white mist is seen to rise. Vapor which is barely perceivable indicates that either the temperature is too low or the material to be vaporized has nothing left in it to give off. Thick, even yellowish fumes are not vapors, but smoke, and the material in the filling chamber is discoloured (dark brown or black) as a result of the excessive temperature. Material can even burn in low-quality vaporizers. An effective vaporizer should be constructed in a manner which rules out the combustion of material from the outset.In less carefully constructed vaporizers material may even burn.